The Dallas Cowboys kicked a late field goal to beat the Oakland Raiders. The field goal may have never happened if not for the use of a note card to measure a first down. 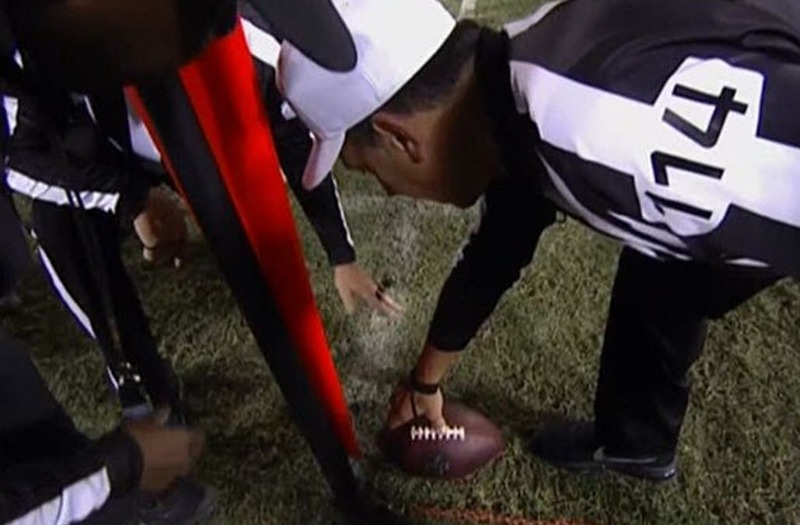 The measurement on a crucial fourth down play was so close the referee used an index card to determine the first down. 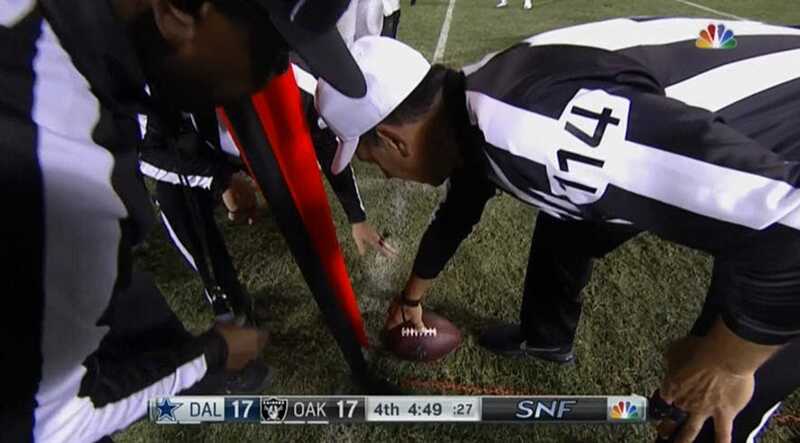 In one of the more bizarre scenes ever seen in an NFL game, the Dallas Cowboys beat the Oakland Raiders, 20-17, when a crucial first-down measurement was determined by the referee using an index card. The incident came late in the fourth quarter with the game tied, 17-17. The Cowboys were facing a fourth-and-1 and decided to go for it. The Cowboys attempted a quarterback sneak with Dak Prescott and it was immediately clear that it was going to be close. When the chain came out to measure, it was still not clear if the Cowboys had gained a first down. So how does one determine if the ball has reached the end of the chain? Apparently you turn to your note card and see if there is any space between the ball and the stick. Referee Gene Steratore took out his note card and placed it against the football and apparently decided a first down had been gained. Gene Steratore looked like he was trying to hold back a smile. Here is the zoomed-in look from NBC. The Cowboys kept the drive alive and eventually kicked a go-ahead field goal thanks to the help of an index card. This is not the first time a referee has used a piece of paper to measure a first down, and according to the NFL, it is perfectly acceptable to do so. During a 2013 game between the Baltimore Ravens and Cleveland Browns, a referee used the same technique to determine a late measurement. In that case, the ruling was that the ball was short of the first down. After the game, the NFL approved of the ruling. "The measurement was handled in accordance with the rules," NFL spokesman Michael Signora told the Beacon Journal at the time. "Once the chains are in place, the referee looks at the ball in relation to the line to gain for a first down, as indicated by the chains, and then makes the call. Though it is very unusual to see the referee use a card to aid in the measurement, there is nothing that prohibits it in the rules."